Birding with the author of Birds of the Czech Republic. The diverse habitats located through the Czech Republic offer wonderful birding opportunities. From lowlands up to the highest mountains, dozens of species can be seen during a single birding trip. Among others, Purple Heron, Black Stork, Saker Falcon, Corn Crake, Hazel Grouse, Black Grouse, Capercaillie, Corn Crake, Barn Owl, Eurasian Scops Owl, Eagle Owl, Pygmy Owl, Little Owl, Ural Owl, Tengmalm's Owl, European Bee-eater, Wryneck, Grey-headed Woodpecker, Green Woodpecker, Black Woodpecker, Great Spotted Woodpecker, Syrian Woodpecker, Middle Spotted Woodpecker, White-backed Woodpecker, Lesser Spotted Woodpecker, Three-toed Woodpecker, Barred Warbler and Common Rosefinch can be found. Although many species are present all year round, the best time for birdwatching is May and June. 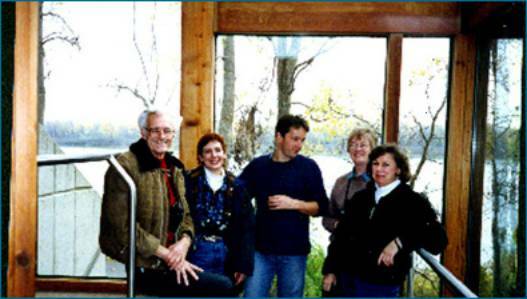 The author with Professor Paul Johnsgard and friends at a birding trip to Iowa. Josef studies brown-headed cowbirds and red-winged blackbirds, and he is the most skilled field ornithologist I have ever known. Energetic and hardworking, Josef spends twelve to fourteen hours every day slogging through marshes in chest waders or crawling on his stomach through dense stands of poison ivy and wild roses, searching for nests of blackbirds, warblers, vireos, buntings and other small birds that serve as cowbird hosts. On that trip he saw about fifty cliff swallows on the incredibly early date of April 13, five days before the birds had ever been reported. I would be skeptical of the sighting if Josef weren’t such a competent ornithologist.